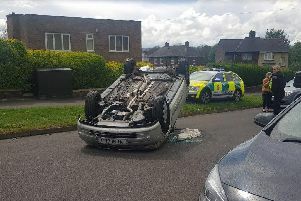 Emergency services have been alerted to a crash between a tram and car in a Sheffield suburb. A green Mazda has been involved in a smash with a tram on Langsett Road, Hillsborough. Cars can get past the crash scene but other trams heading towards Hillsborough are delayed because of the incident.